GIMP is an excellent image edition software which could (should?) 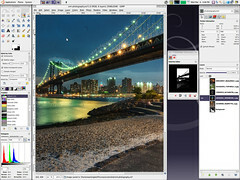 attract all those who do not want to pay the full price of Photoshop, while they work with Apple, Windows or Linux. the differences are real, but the most obvious one is certainly the interface (and Adobe clearly did a nice work on it). So, why not try to prep up your GIMP to make it look like a near-clone of Photoshop? Blair Mathis decided to reduce the distance between them by the installation of several plugins on GIMP. And the result is astonishingly interesting. All the more because the process is fully documented step-by-step, which makes it little more than a longer software installation. Once again, here is how you can (nearly) download Photoshop for free, while being well on the right side of law. ← RAW for the phones?